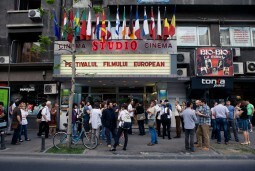 The 20th edition of the European Film Festival will take place between May 5th and May 29th in several cities across Romania: Bucharest, Baia Mare, Cluj-Napoca, Hunedoara, Tîrgu Mureș and Timișoara. Danish film The Commune will open the festival. The film won awards at three European festivals: in Berlin, Vilnius and Luxembourg. This year’s edition of the event features the highest number of films screened so far (85) and the highest number of screening venues in Bucharest (8). The films will be shown in the capital at: Eforie cinema, Elvire Popesco cinema, Cinema Pro, the Romanian Cultural Institute, the European Public Space, the Cervantes Institute, the Czech Center, and the Italian Vito Grasso Cultural Institute. The current edition is also seeing the highest number of cities across the country hosting screenings. The festival will run in Bucharest between May 5th and May 15th, in Baia Mare between May 13th and May 15th, in Cluj Napoca between May 20th and May 22nd, in Targu Mures between May 20th and May 22nd, in Hunedoara between May 27th and May 29th and in Timisoara between May 27th and May 29th. This year’s honorary ambassador of the festival is Romanian director Anca Damian, who has recently won the Audentia award, granted by the Eurimages Fund of the Council of Europe at the 35th edition of the Istanbul International Film Festival. At the same time, to mark the Shakespeare year, the festival will feature a special section, titled Shakespeare 400. The program of the festival can be checked here. Tickets for the screenings can be bought at the box offices of the partner cinemas. Screenings at cultural institutes can be attended for free, within available seating.